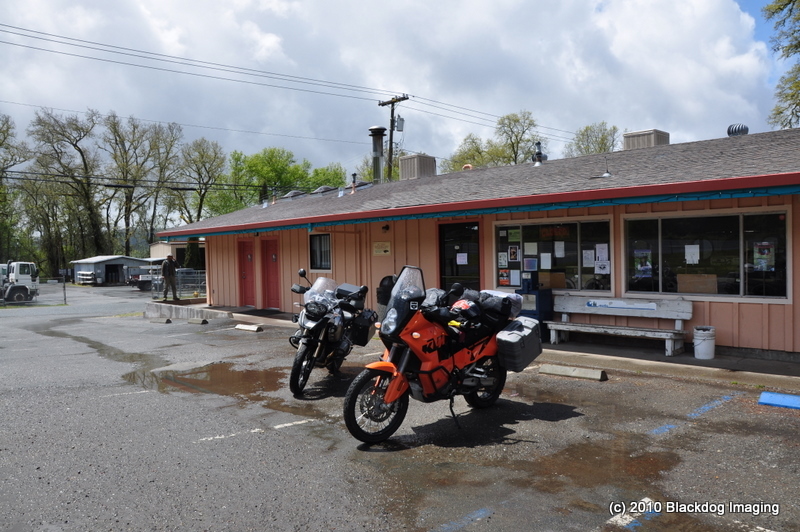 307 miles today, but it felt a lot longer, most­ly due to toren­tial rain, cold, and even a lit­tle snow just north of Lay­tonville, CA. Yikes. Wait­ing this morn­ing in the hotel in Eure­ka, I real­ized that I hate doing noth­ing. I could have spent the day in Eure­ka and avoid­ed all the unpleas­ant­ness, but I was already rest­less in the 20 min­utes I wait­ed, and felt ener­gized when i got on the road. Every­thing went fine except that my gloves were soaked by 60 min­utes in, and get­ting cold. I stopped in Gar­berville for gas, and bought a pair of cot­ton gloves and ‘Marigolds’, you know, big rub­ber kitchen gloves. used those for the next 40 miles, but it was the cold­est 40 miles of the day. up to 1800ft. above sea lev­el, and I actu­al­ly saw a few snowflakes going over Rat­tlesnake Sum­mit. Got to Lay­tonville, had cof­fee and lunch and thawed my hands out: they nev­er got numb, just painful. I also used the lit­tle local ‘free ads’ paper to help dry my gloves out, by rip­ping up the pages and stuff­ing the gloves full, wait­ing 15 min­utes, rinse repeat. Got them somwwhat dry. Got back on the road and felt good. but soon it became obvi­ous that the gloves are get­ting cold­er faster than the heat­ed grips can heat them. 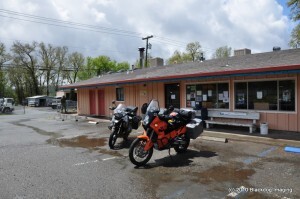 So I stop in Uki­ah and pull into a Hon­da deal­er; not open. there’s anoth­er gent there com­plain­ing of the same thing. Turns out he’s a cop from eure­ka, and a big fan of the Fly­ing Spaghet­ti Mon­ster! yay for ran­dom­ly met friends! but no gloves will be had there today. Down the road I find a sur­plus store, where I score a pair of ladies ski gloves, size large, gore­tex, for $35. I call them my Tom Rob­bins sig­na­ture mod­els, as the thumbs are longer than any I’ve ever seen. In any case, the offer­ing of $35 must have been big enough for the gods as I only had about 35 min­utes of rain the rest of the day. The rest of the trip was grey and blus­tery, some blue sky, and gusty winds. Espe­cial­ly on the point above the Gold­en Gate bridge. just about blew the hel­met over, sit­ting on the ground! yikes. 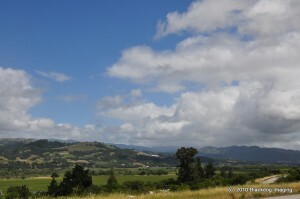 And I had to get back in the groove of CA free­way rid­ing: leave no space and go 80mph! rii­ight! 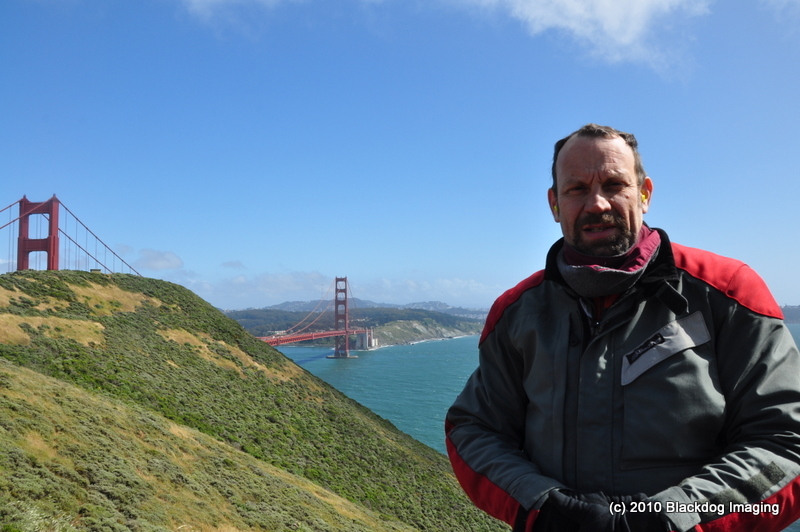 anoth­er 30 miles of real­ly pret­ty light Bay Area traf­fic, and I’m safe­ly land­ed with my friend Mark in San Car­los. A hot show­er and some chill time, and now it’s time for din­ner. see ya tomor­row! 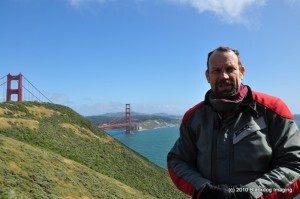 This entry was posted in road trips, walk-about on May 11, 2010 by Jim Harriger.